One of a kind 20 acre private mountain top property overlooking the entire pacific from Manuel Antonio in the north to the Osa and Cano Island in the south. Amazing 180 degree ocean views with year round sunsets from all parts of the property. Very private end of the road location on top of a ridge line surrounded by 1000 of acres of primary jungle with lots of wildlife.. This compound consists of 5 large original separate Balinese structures with a total construction of over 12.000 sq. ft. It features 5 bedrooms and 5 bathrooms and has ample additional land with two additional building pads ready to build on. The property can be reached over a partly concreted driveway. Most internal roads are paved! Fresh water comes from our own deep well. There is electrical hookup with underground cables throughout the property and a 10KWh solar array directly connected to the grid. Fiber Optic Internet gets delivered from the highway with high speed wireless antennas to each house at a speed currently of 6Meg/sec and can be upgraded to a max of 100 Meg/sec. The whole property has an amazing amount of plants and fruit trees that we have collected and planted over the years such as Papayas, Mangosteen, Anonas, Guanabanas and about 3000 Pineapples which have fruits. We are also almost self sufficient with a 1200sft Greenhouse for vegetables and an designated area for chickens, pigs and ducks. This property is an income generating rental business with a 9 year successful track record and high reviews on Tripadvisor. In 2014 we added a 1000 sft Yoga Pavilion and have welcomed already numerous Yoga Retreat Groups at Manu Villas. It also comes with 2 great employees who have worked with us from the beginning and take good care of our guests and the property. In addition we would be happy to work with a future owner as a property manager and continue our work as we did in the past. Original 175 year old teak villa shipped from Java and beautifully restored on a high platform overlooking the rainforest below. Sister Villa of the Joglo I. 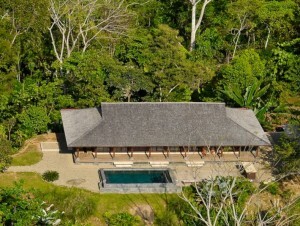 Original 175 year old teak villa shipped from Java and beautifully restored on a platform overlooking the rainforest below. An area currently used as a high end wood shop but built in similar design as the Pavilion which can be used as a restaurant, Yoga pavilion, additional bedroom or atelier.